This exact teapot has sold but I am happy to make another. Let me know above if you would like the colors to be any different than what is shown here. 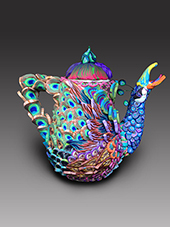 Actual Ceramic teapot covered with polymer clay to look like a rooster. Bright primary colors- tiny hidden pictures within the feathers like lady bugs, dragonflies and butterflies.